iTunes Radio arriving September with ads every 15 minutes? Reckon Spotify and Pandora are scared yet? 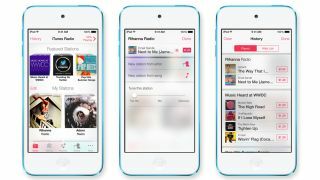 It may just be a few weeks before Apple's iTunes Radio service, announced back in June, will prove whether or not it's a heavyweight contender in the music streaming showdown. According to "people familiar with the negotiations" speaking to AdAge, iTunes Radio will launch in September for iPhones, iPads, Macs, Apple TV and PCs with iTunes. But the same report then drops a word we're not all too keen on hearing – advertising. A number of big brands are said to be on board, including McDonald's, Pepsi, Nissan and Procter & Gamble, which could be paying up to tens of millions of dollars to feature. We're then told that three types of advert – audio, video and full-screen interactive display ads - will appear on iTunes Radio. We'd already heard there would be targeted audio and display ads, but video is a new cross to bear if you want free access. Apparently, audio adverts will run every 15 minutes and video ads every hour, although the latter will only pop up when the service thinks you're looking at the screen. However, all this can be avoided at a price. Apple announced at WWDC that iTunes Radio will come in both a free, ad-based version and in a paid, ad-free flavour. Subscribers to iTunes Match will also be able to avoid getting pestered with adverts. It's likely a September release would see it roll out with the new iPhone 5S (and possibly iPhone 5C) along with the finalised version of iOS 7.